South Milton Sands is a beautiful sandy beach that looks out over the iconic Thurlestone Rock. Its excellent facilities make it ideal for a family day out. Sat nav users, use the postcode TQ7 3JY for South Milton Sands. South Milton Sands is about 5.5 miles from Salcombe. Leave Salcombe on Salcombe Road. Pass through the village of Malborough. Once you’ve passed Malborough, take the second left (about one mile on). Follow the road, passing through the village of South Huish. As you approach the beach, the road will turn sharply to the right. The National Trust car park will appear on your right. Dartmouth is 18 miles from South Milton Sands. Leave Dartmouth on the A3122. After seven miles, you’ll come to a T-junction at Halwell. Turn left onto the A381, following the sign for Kingsbridge. After four miles, turn right at the roundabout, following signs to Salcombe and Kingsbridge. Turn right at the next roundabout and pass through the village of Churchstow. As the road bends right, take a left, signposted for South Milton. You’ll come to the village of South Milton. Turn left at the T-junction and then turn right, signposted for South Milton Sands and Thurlestone Rock. Follow the road, passing the Beachhouse Café on your left, followed by the National Trust car park. The Tally Ho 162 service from Kingsbridge to Hope runs through the villages of South Milton and Thurlestone. South Milton Sands is on the South West Coast Path. This eight-mile circular walk from Thurlestone takes in Bolt Tail, Hope Cove, South Huish, Galmpton and Bolberry Down. South Milton Sands is easily walkable from Hope Cove to the south, and Bantham to the north, as well as being just a short stroll from the other Thurlestone beaches. The manned National Trust Car Park at South Milton Sands has space for around 200 cars. It is free to park there for National Trust members, and for non-members there is a charge of £5 (or £3 after 4 pm). 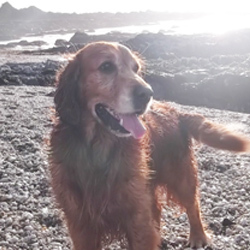 Yes, South Milton Sands is dog friendly all year round. Other unspoilt South Devon beaches with facilities for watersports include Salcombe’s South Sands and Blackpool Sands near Dartmouth. You’ll find South Milton Sands at the southern end of Thurlestone Sands, looking out over the unmistakable arch formation of Thurlestone Rock. This end of the bay is the place to head for excellent facilities, including the popular Beachhouse Café, with its rustic styling and breathtaking views of the bay. You can order snacks and drinks to take away or enjoy a full meal in their restaurant, which has an excellent reputation for high-quality, locally sourced food. Lifeguards monitor swimmers and other sea-goers at certain times in the summer months. Kids love exploring the rockpools at South Milton Sands and to the north, while birdwatchers can also visit South Milton Ley, a coastal river valley just behind the beach. Access to some parts of this site is restricted to members of the Devon Birds association. The National Trust, which owns part of the beach, runs several events every year, such as ‘The Rock Watersports Festival’ which will take place on 25th and 26th June 2016. The rangers also organise regular “Beach Fun” sessions involving games, rockpooling, handicrafts and so on. Driving to South Milton Sands is relatively straightforward but the beach is also placed perfectly to walk there from a nearby beauty spot along the Coast Path. Alternatively, make South Milton Sands your starting point for a number of unforgettable walks. A coastal stroll south from South Milton Sands will take you to Hope Cove’s two beautiful beaches, a walk of just over one mile, where you’ll find an extensive range of cafés, pubs and restaurants. Heading north on foot, you will reach the northern Thurlestone beach in 10 minutes or so. Another mile on from there and you’ll reach Bantham beach, one of the most popular seaside spots in South Devon. As a beach that combines excellent facilities with an out of the way, unspoilt feel, it’s hard to do better than South Milton Sands, which explains why it’s a firm favourite with South Devon locals. 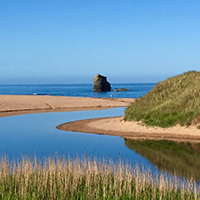 Find your perfect beachside holiday home from our range of 30 stunning properties around Thurlestone and South Milton Sands. For comprehensive information about South Devon’s best beaches, see our South Devon Beach Bible.